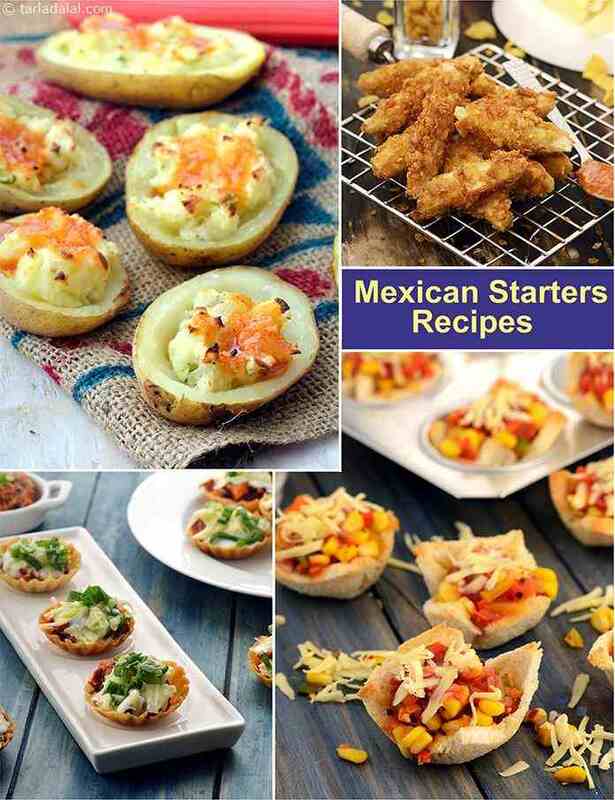 Flag off the meal with trendy starters like Mexican Bread Tartlets, Crispy Cottage Cheese Mini Tortillas or Mexican Style Baby Potatoes, to be relished with tangy sauces and peppy accompaniments like Garlic Tomato Salsa . Cute, little Mexican Bread Tartlets are filled with a delicious mixture of corn, capsicum, tomatoes and onions and topped with a generous layer of cheese. These tartlets must be eaten warm after they’re baked and the cheese is all molten. A great snack for children! Excitement to the core, the Mexican Style Baby Potatoes is surely not baby stuff! With lip-smacking refried beans, tangy salsa, sour cream, seasonings and herbs, the baby potatoes transform into a really exotic treat, Mexican style! You can keep the boiled potatoes, refried beans and other ingredients ready in advance but prepare this marvellous dish just before serving, to retain the fresh taste and texture.